In the relatively short history of jazz, many strange and spectacular characters have made unique contributions to the music and its lore. April 1999 marks the 43rd anniversary of the time one of the strangest, and in some ways most spectacular characters attracted attention with a comeback album. His name was Boyce Brown, and he had been among the best saxophonists in jazz, rating high in the survey lists of Down Beat magazine, the bible of jazz. But it wasn’t so much the comeback as it was where he came back from that attracted attention. Brown had given up music to become a Brother in the Catholic Church and was in the midst of undergoing years of training to enter the strict Servite Order. He was having a middle-age metamorphosis, and his effort to create a new life was causing considerable controversy within the Church, where many priests and Servites questioned his seriousness of purpose and wondered whether he really had abandoned his former life. Boyce Brown was a man out of place — out of place in jazz, and, because he came from the jazz world, perhaps out of place in the world of Catholicism that he sought. If ever a soul seemed lost in the raucous, raunchy, rigorous life of jazzmen, it was the gentle, contemplative, ascetic Boyce Brown, whose quiet, unobtrusive nature was made the more so by impaired vision, an odd appearance, and herky-jerky body movements caused by physical deformities. 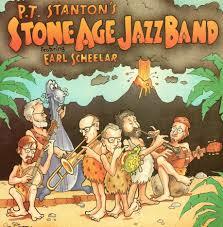 Yes, for 20 years or more, he was listed among the top alto saxophonists in jazz. His birth in Chicago, or April 16, 1910, had been difficult. It was a breech delivery, and when Boyce finally emerged, he was seriously injured. The doctor put Boyce aside and devoted his attention to saving the mother. Boyce’s Aunt Harriet, who was in the delivery room, saw what was happening and moved to do what she could for the baby. She picked up the misshapen and struggling newborn and literally shaped his head with her hands, saving his life. But, among other injuries he suffered, one eye was gone and the other was damaged. So, as an adult, Boyce Brown faced the world with a glass eye, limited vision in the other eye,an oddly-shaped head and a partially caved-in chest. He walked sort of lop-sided, with a halting, loping gait, one shoulder drooping. Sometimes he would hold his head at funny angles, stretching out his neck like a bird truing to find kernels of grain. Some people even called him “Bird” in those days before fellow altoist Charlie Parker came along and became “Bird” for all time. It wasn’t just his appearance that set Brown apart in the jazz world. He liked to write poetry, and he liked to talk about it and discuss philosophy and other deep, unjazz-like subjects, to the confusion and consternation of his fellow musicians. Besides, he lived with his mother. Boyce started playing the saxophone at 14 and by the time he was 17 in 1927 got his first job. It was with a trio in a joint called Amber Light, owned by Al Capone and managed by Bugs Moran. Moran showed solicitude for the youngsters in the band by telling them to hide behind the piano if customers started shooting. Brown’s playing attracted the attention of other musicians, and when Tommy and Jimmy Dorsey came to town with their new joint band, Tommy went to hear Boyce and then asked him to join them. But when Boyce sat in with the Dorsey band, he got the volatile Tommy upset when he cocked his head at a strange angle and leaned over to squint at the music. Tommy thought the audience would be distracted and put off by the contortions. Boyce told Tommy he had to bend over only once per sheet of music because he could memorize it at a glance, despite his poor vision. He had a photographic memory, and perfect pitch as well. Nevertheless, Brown lacked self-confidence, and he also was afflicted by a sense of responsibility. He felt he should stay with and support his mother because his father was an alcoholic and unreliable. So, Brown stayed home. Although he subsequently toured around the country with different bands, he chose to play most of the 20 prime years of his musical career at the Liberty Inn, a strip joint on Chicago’s rowdy North Clark Street. Boyce Brown in the Liberty Inn was the definition of incongruity. He drank, but not to excess, and, of course, he couldn’t see much of what was going on. Sometimes he sat backstage between shows reading philosophy, his face literally buried in the book. This disturbed some people because they didn’t understand it. Despite his aloofness, Brown liked the girls. They were kind to him and seemed to understand him — although they perhaps wondered why he never made passes at them and otherwise ignored their nakedness. He told friends that the girls were nice and not bad as most people seemed to think. At one point, Brown was briefly engaged to a girl outside the business, but he again decided he couldn’t leave his mother and Aunt Harriet, whom he also was helping. Time and again he left the Liberty Inn to play with other bands, but he always returned. Something there suited him. 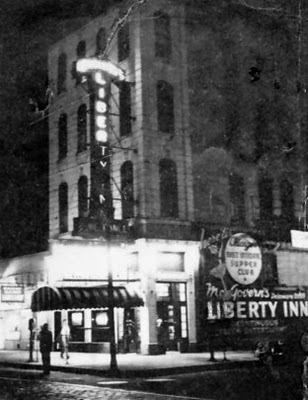 Maybe it was a psychological refuge; there was much honesty and little pretense in the Liberty Inn. As the years passed, Brown was bothered more and more by the contrast between his manner of making a living and his attitudes about life and people developed through his philosophical readings. He got in the habit of going for long walks in the early morning hours after work, wondering about his life as a musician, the paradoxes and the fact that he wasn’t fully utilizing his abilities. He became depressed and even thought about suicide. 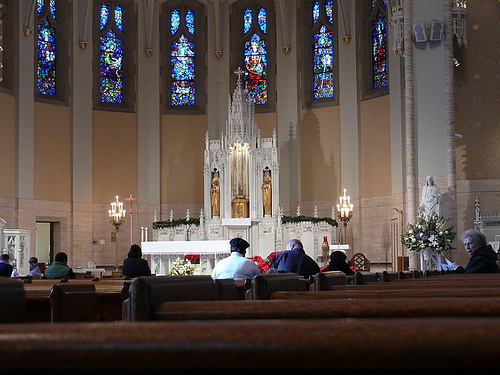 One morning his walk took him past St. Gertrude’s Catholic Church on Granville Avenue, and he heard organ music. He stopped to listen. As children, he and his brother, Harvey, had been iterested enough in classical music to stage record concerts for their friends. Brown returned to the church morning after morning to listen to the music, and he soon began going inside to hear better. One morning a priest noticed him standing in the shadows at the back of the church and approached to welcome him. From that contact, one thing led to another and on August 12, 1952, Boyce Brown, who had been raised an Episcopalian, became a Catholic. He was 42 years old. But just being a Catholic didn’t satisfy him. He wanted deeper involvement. One day at St. Gertrude’s, he met Father Ed Calkins, a missionary of the Servites, a religious order of friars started in the 13th century. Brown asked about taking his religious feelings further. Father Ed sent Brown to the Servites’ director of vocation, Father Hugh Calkins, his brother (two other Calkins brothers also were priests). Father Hugh listened as Brown described his concern about being accepted for further work in the church. He feared his background of playing jazz in “low” places for so many years would rule him out. Father Hugh let Brown ramble on about his worries for a time, and then told him he would make a good Brother in the Servite Order. As for jazz, Father Hugh said, it just so happened that he himself was fond of jazz. In fact he was a pretty good amateur pianist, if he did say so himself, and felt he and Brown would enjoy playing together. After a few more interviews, in the fall of 1953 Boyce Brown entered the monastery and began training to become a Brother. When Father Hugh was questioned by a superior about Brown’s seriousness of purpose, he said Brown was one of the most deeply spiritual men he had ever met. Two years later, Brown entered the Novitiate at Mount Saint Philip Monastery about 10 miles north of Milwaukee and on Feb. 26, 1956, took his vows as Brother Matthew. Part of Boyce Brown’s training, and his vocation as a Brother, involved menial work in the monastery, kitchen, tailor shop, laundry, bakery, and boiler room, and he swept the halls. Sometimes, when his work was done, he played the saxophone, but not often. His first year of training, he played hardly at all, so everyone was surprised when, at the Christmas party, Brother Hugh sat down to play the piano — and called on Brown to get his saxophone. When he and Brown got going, Father Hugh said, they “rocked the refectory,” and played together many times after that. Father Hugh, outgoing and enthusiastic, had a talent for public relations — another incongruity — and when Brown took his vows, the priest sent out a press release. A week later, Time Magazine and other publications carried items with the news. About two weeks after that, the Chicago Tribune carried a front-page story about the jazzman turned Brother. This was followed by a picture story in the Trib‘s rotogravure section. As the word spread, ABC-Paramount telephoned Father Hugh and asked if Brother Matthew could go to New York and make a record. Father Hugh, bursting with excitement, got an okay from church superiors and then got in touch with jazz spokesman Eddie Condon, who knew Brown in his early days, and asked him to handle arrangements for a record date. Boyce Brown’s and Father Hugh’s “secret” was that they played jazz in a monastery. The panel was game show host Bill Cullen, who was raised a Catholic, radio comedian Henry Morgan, supposedly an agnostic; and actress Faye Emerson, then married to bandleader and pianist Skitch Henderson. Her religious beliefs were unknown, but she was the one who guessed the “secret,” but not until the time allotted to do so had expired. She finally remembered seeing Brown’s picture in Time, and Henderson had told her about Brown’s past and background. Father Hugh and Boyce spent that night in the Abbey Hotel, and the religious motif was played to the hilt. The next day, a Life Magazine photographer showed up at the recording session, and a spread of pictures appeared in the April 23, 1956 issue. 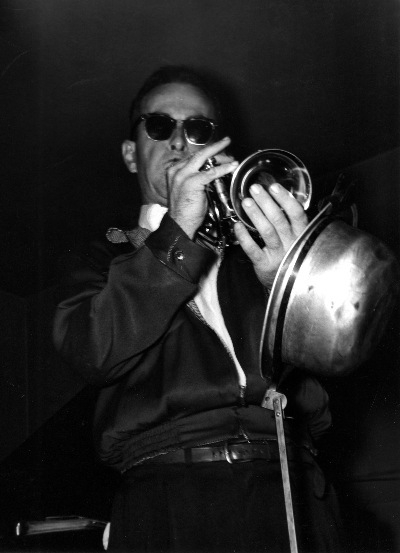 Condon had rounded up a band of star jazzmen: on cornet, Wild Bill Davison, who had played with Brown in the old days; Gene Schroeder on piano; Pee Wee Russell on clarinet; Ernie Caceres on baritone sax; Cutty Cutshall on trombone; George Wettling on drums; Bob Casey on bass and on a few numbers, Paul Smith on guitar. The session was a little more orderly, somber and sober than might have been the case in Brown’s former life, but Davison and a couple of others nevertheless broke out the booze, and Brown joined in without hesitation, showing he still was one of the boys. Unfortunately, he still wasn’t one of them musically. The tunes played included Brown’s “theme song,” “The World Is Waiting for the Sunrise,” plus “Sweet Georgia Brown” and “Blues for Boyce,” a tune improvised for the occasion. While Brown still was holed up in the Liberty Inn tootling for the strippers, the others had been learning from each other and their colleagues and developing as musicians. The upshot was that his horn figuratively became caked with rust. However, the record was issued, entitled Brother Matthew, and although it wasn’t really that bad, it was not a success. It did not create a demand for more music from the monastery. This was a disappointment to Father Hugh, but probably not to Brown. Father Hugh had hoped to use the record as a fund-raiser for the Servites and their missions in South Africa, but a hit record and satisfying demands for more might not have been Brother Matthew’s idea of serving God, his fellow man and himself in the quietude of a monastery. Brown told Father Hugh he felt he had said all he had to say through his music. After all, that was a life he voluntarily gave up. So, sans success, Brother Matthew was allowed to go back to his chores and his meditations, but his serenity was gone. In early 1957, Dave Garroway called and wanted to do a segment on Brother Matthew for NBC’s “Wide Wide World” program on Sunday afternoon. The idea was to contrast Brother Matthew’s playing with a dixieland band with the Gregorian music sung by the Servite members. This was done and went out over the network, live. Father Hugh described the broadcast as a success, but perhaps the superiors were beginning to wonder about all the worldliness and all the talk from Father Hugh about good public relations. Was this a religious order or was it Madison Avenue? Whatever was actually said, or implied, brown began to worry about his future with the Servites. Final vows to enter the Servite Order for life were coming up, and Brows was afraid he wouldn’t be accepted. He told Father Hugh of his concern, and when the priest went before his superiors in the monastery at Hillside, a Chicago suburb, he discovered that Brown’s fears were well-founded. They thought Boyce Brown was an alcoholic and not ready to devote his life to the Servite Order. Sometimes the other members smelled alcohol on his breath. A bottle of booze was found in his room. One Sunday, he left the monastery to play a few hours in a band led by drummer Danny Alvin and returned with the smell of liquor about him. Once, his hands shook when he was helping a priest serve Mass. Father Hugh pleaded the case. He pointed out that members of the Order were allowed to drink in moderation and that’s all Brown was doing. He said there was no evidence that he ever drank to excess. His hands shook because of nervousness. Father Hugh cited Brown’s value to the Order as a fund-raiser and as an entertainer of the other members (which may have been the wrong approach). Father Hugh said he had never known anyone with a deeper spirituality, with a richer goodness of soul. The superiors were unmoved. They told Father Hugh he was prejudiced in favor of Brown because they were friends, they played jazz together and Father Hugh loved jazz. There was every indication they would not accept Boyce Brown when he came up for consideration. Father Hugh’s grand public relations gambit — a Brother who played jazz — had backfired. But Brown never came up for consideration. A few days before the day he was to face the superiors, he helped serve a meal at the monastery, then sat down to eat. But instead of eating, he got back up and went to his room. He took off his robe and folded it neatly. Then he lay down on his bed. A few minutes later, a painter working in the next room heard an unearthly, terrible moan. He called a priest. Boyce Brown was dead. It was Jan. 30, 1959 — two months and 16 days before his 39th birthday and two years and 10 months after the Brother Matthew record was made. “God spared him from possible being rejected,” Father Hugh said. In the aftermath of Brown’s departure, Columbia Pictures called Father Hugh to talk about making a movie of Brown’s life, with Father Hugh as technical adviser. He was, of course, enthusiastic and the idea went as far as a scriptwriter coming to interview Father Hugh in depth. Then he told the monastery superiors about it. The rejection was flat and unequivocal; the lives of the seminarians would be disrupted by movie people wandering around and climbing all over the monastery. The project was called off. By the way, Father Hugh had envisioned Anthony Perkins in the role. Note: I’m very grateful to Jim Denham of SHIRAZ SOCIALIST (http://www.shirazsocialist.wordpress.com.) for uncovering a copy of this truly detailed article. Hal Willard died not long ago, so I can’t thank him in person, but his research into Boyce’s life and his conversations with Father Hugh Calkins were invaluable. A long and beautiful overview of Boyce’s life and recordings can be found in Richard M. Sudhalter’s LOST CHORDS, with comments from Dave Dexter, Jimmy McPartland, George Avakian, and others — including excerpts from Boyce’s poetry and a letter he wrote to that “bible of jazz,” Down Beat . . . where he had won the 1940 poll for alto saxophone. Posted in Awful Sad, It's A Mystery, Jazz Worth Reading, Pay Attention! Many of the greatest artists make their creations sound simple. Think of Bing Crosby, Joe Thomas, Benny Morton, Count Basie. Clarinetist Rod Cless belongs to their ranks, but seems a forgotten man. In the ensembles, he has some of the daredevil quality one associates with Pee Wee Russell and Frank Teschmacher, diving-off-the-high-board descents from a quavering note. But the rough edges are smoothed down, the vibrato more songful, less fierce. In his solos, Cless sounds like someone who knows the beauty of the clarinet’s low register, the virtues of thoughtful space. He takes his time. He has something to convey, and it can’t be hurried; it needs a kind of plaintive candor. And although his harmony is not abstruse, his phrases more regular than abrupt, what he has to tell us sounds familiar only because so many players coming after him have absorbed his message without even being entirely aware of it. I hear the influence of Jimmie Noone in the full, round lower register, as well as touches of deep New Orleans blues. But also — even though there are no phrases copied from the master, it is not hard to hear the ghostly influence of Bix in Cless’s soulful restraint. Here are three more sides with Hodes from a 1942 Decca date with an illustrious personnel that didn’t otherwise gather in the studios: Sidney DeParis, trumpet; Brad Gowans, valve-trombone; Cless; Hodes; Condon; Earl Murphy, bass; Zutty Singleton, drums. Cless was born in 1907 in Lennox, Iowa. He was a fine athlete and accomplished clarinetist who also doubled on saxophone. The start of his enlightenment seems to have been a six-week engagement that Bix Beiderbecke and the Wolverine Orchestra played in Riverview Park Ballroom in Des Moines in 1925: Cless came every night. Frank Teschmacher, the brilliant young Chicagoan, befriended Cless, and Cless came to Chicago two years later as a professional musician — an intimate of Eddie Condon and Bud Freeman (Cless married Freeman’s sister). I’ve read that Cless played in the Varsity Five, a hot band much admired at Iowa State University, but do not know if he attended college there. Returning to Chicago, he worked with trumpeter Louis Panico at the Wig Wam Club and found employment in reed section of dance orchestras. He also made extra money teaching clarinet. After Spanier disbanded the Ragtime Band, Cless worked with Wild Bill Davison, Art Hodes, Ed Farley, Marty Marsala, George Brunis, and Bobby Hackett. But Cless’s marriage failed, and his drinking grew heavier. Walking home from the last night of a job at the Pied Piper (where he played alongside his friend Max Kaminsky) in December 1944, Cless fell over the balcony of his apartment building and died four days later at 37. In his autobiography, Kaminsky blamed himself for not walking Cless home — even though Cless insisted that he could make it himself. And to conclude (for this post), here’s something quite atypical — JAZZ ME BLUES by Frank Teschmacher’s Chicagoans, recorded in April 1928. Tesch plays clarinet and alto; Cless plays alto; Mezz Mezzrow is on tenor saxophone; the rhythm section is Joe Sullivan, Jim Lanigan, Eddie Condon, and Gene Krupa. This track comes from www.redhotjazz.com: http://www.redhotjazz.com/ftc.html. Those fascinated by the sound of Rod Cless can find several more examples on YouTube — where a number of the Bluebird sides from 1939 by Muggsy Spanier and his Ragtime Band — are available. Cless also turns up on a singularly relaxed session for Commodore which features Kaminsky, valve trombonist Frank Orchard, and James P. Johnson. Nearly the same band — with Willie “the Lion” Smith on piano recorded for Decca and for Black and White. And in Cless’s last year, ironically, he had his only opportunity to lead a record session — for the Black and White label, featuring James P., Stirling Bose, and Pops Foster. Those four sides were once available on a Pickwick anthology CD. 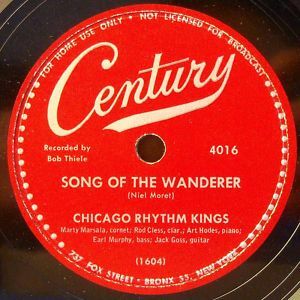 Eight others (plus a few alternate takes) by a 1940 Hodes group called the CHICAGO RHYTHM KINGS (pictured at top) — one session featuring Marty Marsala, Cless, Hodes, Earl Murphy, and Jack Goss on guitar; four trio sides with Cless, Hodes, and Murphy (originally recorded by Bob Thiele and several of the trio sides reissued on Doctor Jazz) are difficult to find (the last complete issue of the issued takes was a 10″ Riverside lp, which is now fifty-five years ago). I plan to return to Cless as a subject in a future post, although from a different angle. I hope to interview one of the elder members of the jazz tribe, someone who actually took lessons from Cless in the early Forties. Until then, I suggest that Cless is worth close and repeated listenings.